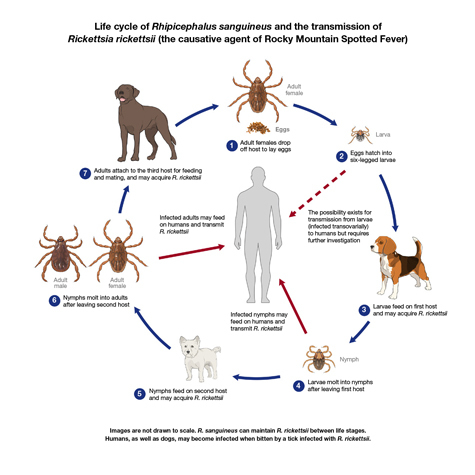 It’s the ‘dog days’ of summer, and that means tick season in North Carolina! We’ve all heard of the most common diseases transmitted by these most hated critters, like Rocky Mountain Spotted Fever and Lyme Disease. This year, you have probably heard warnings about two new ticks! Within the last week, you may have heard about an East Asian species called the Longhorned Tick. This one was confirmed in June 2018 to have taken up residence in North Carolina. At this point, it seems to infest mostly animals, including dogs—but, it has been reported to be an aggressive biter and can result in stress, reduced growth and blood loss in animals it infests. The second ‘new’ tick has been associated with a bizarre allergy: Its bite can results in a red meat allergy. Really! If you are bitten by a Lone Star tick (found in NC, despite its name), you may develop an allergy to red meat, as part of your body’s immune response. The tick transfers a sugar through its bite, resulting in the production of antibodies—generally the body’s way of protecting itself. The problem is that the ‘alpha-gal’ sugar injected by the Lone Star tick is similar to a sugar found in red meat. As a result, if you tend to be prone to allergies, you are more likely to produce the antibody if bitten, and become allergic as a result. To make the disease even more bizarre, symptoms typically do not show up until several hours after meat has been consumed. As a result, people often do not associate the tick bite with the allergic reaction to the red meat. But, depending on your sensitivity, the outcome can be quite severe, ranging from a mild case of hives to full-blown anaphylactic shock! Now that I have your attention: The good news is that the Lone Star tick is found in North Carolina mostly near the coast (it does live in the Piedmont, but is less prevalent than the more common American Dog tick). And, for many, cutting red meat out of the diet for a while (often 1-2 years), then slowly reintroducing it resolves the allergic reaction. Of course, avoiding ticks and their bites is the best solution of all! Following a few simple rules will keep you, and your family and friends safe! 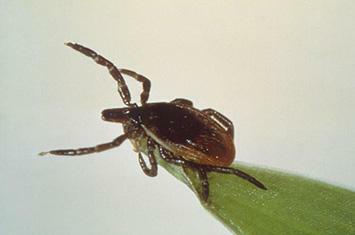 Most ticks are most active during warm weather. They need to feed at least once during each part of their life cycle, and they seek their host by odor, heat or vibration. They position themselves to find a host by assuming a posture called ‘questing’. They can’t fly or jump, so they crawl to the top of a blade of grass or other object, where they hold on with their hind 2 pairs of legs. This frees their forelegs for grasping. When someone walks by, brushing against them, they climb on, and quickly seek out places where the skin is thinnest to enjoy their meal. Wearing long pants when walking through tall grass or shrubbery may eliminate the opportunity for ticks to latch on. Better still, remain on trails—preferably wide ones—and away from tall grass where ticks may live. Apply insect repellant liberally when you are hiking in these areas. If you are hiking long distances or camping, you may need to reapply repellants often—of course, always read and follow the label directions. When you are walking or camping in habitats where ticks may live, it’s important to check carefully for ticks at least twice a day. That means checking carefully behind your ears, through your hair and in any other crevices. The good news is that generally ticks must be attached for 6-24 hours in order to transmit disease. If you locate a tick somewhere on your body, you’ll need to take care to remove the entire organism. Make sure you protect your fingers by using tweezers or grasping the tick with a folded tissue. Disease organisms can enter even small breaks in your skin. Pull gently, but firmly to remove the entire tick—if the mouth parts break off under the skin, you’ll need to remove these as you would a splinter. DO NOT use home remedies to remove ticks—lighting a match or lighter, or spreading petroleum jelly over it are generally not effective and may kill the tick (or burn your skin) while it is still attached. It is important to remove all parts of the organism. Ticks must feed during each part of their lifecycle. If you are bitten, it is helpful if you can preserve the tick in alcohol and note the date of the bite. This way, if you develop any symptoms of illness, identifying the tick may help your doctor with the diagnosis. You can enjoy our warm, muggy North Carolina summers—but, take a little extra care to avoid the potential for injury or illness! It doesn’t take long, but, it is important! Get outside! Want to attend free gardening classes? We have several different topics to choose from. Interested in becoming an Extension Master Gardener℠ volunteer? Call us with your gardening questions! Our Extension Master Gardener℠ volunteer Infoline is staffed Monday, Wednesday, Friday from 9:00 a.m.-12:00 p.m. and 1:00-4:00 p.m., and on Tuesday, Thursday from 9:00 a.m.-12:00 p.m. The phone number is 336-641-2404 and the email is guilfordmg@gmail.com. • Beware of Those Itsy, Bitsy Spiders!